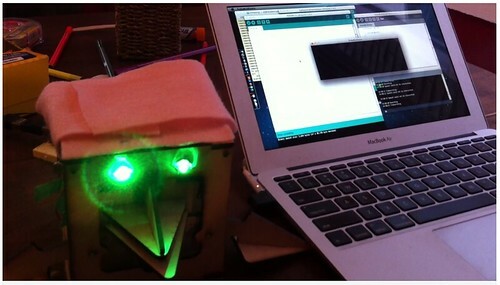 Here is a really chirpy cool hack from @eightlines, a RoboBrrd that responds to voice commands! In the video, you can see that as he says different colours, then the RoboBrrd will change the colours of its eyes. It works by connecting the RoboBrrd to Processing. In Processing, it uses Florian Schultz’ Speech to Text Library (STT). Check out the video of it in action below! 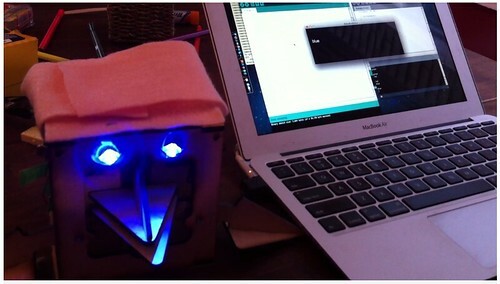 RoboBrrd Voice Commands from Eightlines on Vimeo. You can find the example code here. Thanks for posting about this hack eightlines, and as he mentions: “you can add on to the script to make it do more”! This is a really neat way to interact with RoboBrrd! Let us know if you also try out some voice commands too. Read more about it on eightline’s blog! This entry was posted in Hacks and tagged colour, command, hack, language, leds, processing, speech, voice, voice command. Bookmark the permalink.